I've wanted to be a part of the Just Add Ink family for a while and I can't believe that I've been chosen to be on their Design Team. I'm completely thrilled and overwhelmed at the same time. I seriously teared it up when I read the email that I'd been chosen!!!!!! All the JAI DT ladies are so talented and inspiring that I know I'm certainly going to need to put in 110% for all my creations to keep up with them!!! 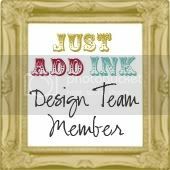 There are also 3 other new DT members to welcome on board so pop on over to the JAI site and check them out! I'm really looking forward to working with all the JAI team. Keep your eyes on this space for my first creation for JAI very soon!!!! Yay so very exciting. Congratulations and welcome! I'm so glad you are joining us. Trish! Congratulations!!! That's fantastic. Looking forward to seeing your entries. Wonderful news Trish, I am thrilled for you, however you don't need to "keep up". you are already well and truly there.